Goodbye, Arizona! Hello, World! A New Year. A new life. Early Sunday morning while rummaging through the food-sparse kitchen in our Scottsdale condo, I realized we had little time to go out to eat with packing utmost in our minds. Having given away most of our food supplies, we had few ingredients on hand to make breakfast. With a plan to go to Tom's sister's birthday party in Apache Junction, I started cooking a rack of baby back ribs I had taken out of the freezer the night before in an effort to wipe out the remnants of any unused food. With a bottle of barbecue sauce on hand (no time to make homemade) I could make the ribs to bring to the party, along with additional chicken and ribs we had promptly frozen, leftovers from Christmas. Perfect! Any easy dinner for all! Breakfast was another matter. Scrounging through the fridge, I found a package of organic grass fed hamburger I had also thrown in the refrigerator to defrost the night before. With no ketchup, no salad and of course, no buns and only hamburger patties and cheese it could be a hearty, albeit boring, breakfast. As the ribs cooked, I fashioned three uneven hamburger patties adding only salt and pepper (the only seasonings left on hand) tossing them into the pan with the ribs. Fifteen minutes later, Tom and I sat at the dining room table overlooking the pool, with a paltry single burger laden with three squares of unknown cheese for me and two for Tom. We looked at each other, then our plates, then back at each other again. We smiled at the exact same moment...improvise, we most certainly thought at exactly the same moment. We knew we were getting "it" under control, "it" being the ability to make do with what we have on hand, a process we surely will master in time. We started it two months ago when we came here and the low profile toilets became plugged every other day and we came to discover that drinking the tap water was at "one's own risk." We muddled through when the frying pan was too small to make a decent breakfast so I learned to "bake" omelets in a glass pie pan covered with no-stick foil along with a giant single baked coconut flour pancake to-die-for baked in a 9 x 11 Pyrex glass baking pan. Eventually, I purchased a lightweight frying pan that now feels like a burden when trying to find a place to pack it today. There's simply no room in our bags for a frying pan. Bye, bye, frying pan. No more of this foolishness. We'll make do with what we have. We've learned our lesson. After eating the cheesy burger balls, we returned to the repacking of our stuff, sucking the air out of the space bags finding we needed to use the seventh bag, a older black Samsonite we had brought along for the warmer clothing we needed while here. It would have been great to fit everything into the six orange bags. We mutually agreed that we'll ditch the black bag as we learn to pack leaner along the way, a necessary evil for homeless travelers such as ourselves. We'll get better at this. Later in the day we were out the door to the party a mere half hour drive to Apache Junction, leftovers in tow, a little tired, a little anxious and definitely a little preoccupied. Tomorrow, Tuesday, we leave for San Diego. Two days later, we board the Celebrity Century to begin our worldwide journey. After an enjoyable evening with Tom's three sisters and two brothers-in-law, ending in a heartfelt round of goodbyes we headed back to our condo for the last time. These two months proved to be valuable, to gather and learn our digital equipment, to organize financial matters, to prepare and execute our wills and living wills, to preliminarily prepare our taxes and to arrange our insurance. More than anything, these two months were used to prepare our hearts and souls for this life changing and mind wrenching experience of a lifetime that we enter cautiously optimistic, with a little fear, a lot of hope and wild sense of adventure. So, we say goodbye Arizona. We don't know when we'll see you again. We say hello world, we're on our way. We'll see you soon! May all of our readers have a very happy New Year filled with opportunities for personal growth and discovery. We're never too old to learn. After a fitful night with my painful shoulder, I awoke with a sense of uncertainty. Departure date is looming. Why am I feeling this way? It should be a joyful time full of wonder and excitement and yet this morning I found Tom in the living room long before I ambled out of bed unrested at 7:30 am, quietly perusing his online newspaper. He, too, seems a little out of sorts. This will pass. When we're standing on the deck of the ship waving goodbye to loving family members who insisted they are coming to see us off at the pier to hug and then wave a genuine "Bon Voyage," we'll feel better, I'm sure. This is to be expected. After all, we are leaving everyone we know and love behind to selfishly go on the adventure of our lives, leaving us with a legacy of stories to tell our grandchildren while hopefully seeing them along the way, adding to their own life experiences. My emotions grasp at this morsel of wisdom filling my soul with hope and anticipation. While on the return five hour drive back to Scottsdale on Thursday, leaving the Henderson house spotless and in tiptop condition, we made a new 'to do" list of items we need to address in the few remaining days until we head for San Diego where on January 3, we'll board the first cruise ship for our many year's long adventure. Having decided we wouldn't do any further cooking with only four days to go we made our way to one of our favorite breakfast restaurants, US EGG after I worked out at the local LA Fitness where I joined as a temporary member for the two months here. Lately we've been eating one big healthy meal early in the day with a lighter meal in the evening. Tom devoured his scrambled eggs, bacon and sausage while I feasted on their fluffy three egg, chicken, bacon, avocado and cheese omelet. After several cups of coffee we headed out to begin knocking off our long list of 'to do's". Or first task was yet another trip to our bank, one of many in preparing for our world travels. We had opened two new "travel accounts" not linked to our regular accounts that our bank had suggested provides additional security. Keeping lesser amounts in the travel accounts to use as needed, we keep our basic funds secure in separate accounts. Then off to the tailor shop to pick up Tom's three pairs of pants for the cruise, that were swimming on him after his recent weight loss. The day zoomed by as we made one stop after another, reveling in the satisfying feeling of getting the mundane tasks completed including shopping for last minute toiletries, a trip to the post office, a short visit to Costco. Back at the condo, Tom busily worked on insurance paperwork while I became preoccupied in sorting and consolidating our lofty two year supply of vitamins and supplements, all the while wondering how they'd all fit into our luggage. Today is the day to begin the repacking of all the clothing, shoes, swimwear, cruise wear including dressy clothes formal nights, Africa clothing, boots, hats, special gear, gadgets, electronics and every other item we've mentioned in this blog over the past 10 months as necessary for us homeless travelers. Our handy little suction vacuum in tow, the process will begin shortly. The goal is to complete the packing today with our plans to leave Scottsdale on Tuesday, driving to San Diego for our final two days staying with family not far from the pier. Tomorrow, Tom will find a sports bar so he can watch the Minnesota Vikings game and later we'll head to Apache Junction for Tom's sister Colleen's birthday party. Once we close our bags in the next few days they won't be opened again until we are aboard the Celebrity Century for our 15 day cruise through the Panama Canal. We'll keep aside two days of clothing to wear in San Diego in addition to that which we'll wear on boarding day. Oh, its getting close, so close. Its hard for us to believe after all the planning. There's still much to do before the 3rd. We've made it this far. We'll muddle our way through the rest. Stay tuned. More will follow. As Tom's three sisters and two brothers-in-law walked out the door yesterday, the day after Christmas, they asked us of we were getting excited. Tom, not giving me a chance to answer, chimed in, "You know what? Jess planned all of our world travels. And I just went along with it, figuring that the world was gonna' end on December 21st and it wouldn't matter. So now, it does matter and its time to start getting excited." We all roared with loud bursts of laughter. I had nothing more to say after that. They were all headed back to their winter homes in Apache Junction, Arizona and us, today back to our awaiting vacation home in Scottsdale to hook up with them again on December 30th for final goodbyes and sister Colleen's birthday party. Yesterday morning, we met up with my dear sister Julie and her significant other at son Richard's office in Henderson to have our wills and health care directives witnessed and notarized which will be secured in family's member hands while we travel. Yes, it was morbid doing this but a necessary element of our travels and life itself. Handing Julie our complete medical files put our minds at ease that should we ever need anything she'll have it readily available. Julie like me, embroils herself in the details, making her a logical choice. Of course, she would immediately notify all of our children if anything happened to us. In addition, we have designated Julie as our contact person. We will report to her with the contact information, phone numbers and email for property owners prior to departure and arrival at each location. For instance, if we are due to arrive in France on a certain date and Julie doesn't hear from us within 24 hours, she will immediately notify our adult children and begin the process of finding out what has transpired. This is important. We've all heard stories of travelers being kidnapped, lost in a jungle or any other possible scenarios. Its unlikely any of this will occur to us. In the event an unforeseen situation does occur Julie will be highly diligent in tracking us down. This provides all of our family with a sense of security. Although a little time consuming, it's also is a comfort to Tom and I knowing that a nearly immediate effort would be instituted to "find us" if we're missing. 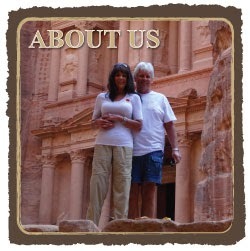 Julie, a TV producer, is an experienced world traveler with many worldwide contacts. Its logical for her to be assigned this task. Thanks, sis! device. I've mentioned this many times in this blog finally placing our first order. Pricier than we anticipated at $538 for the first month, we bit the bullet. The usual cost for using the device in one country is $399 a month plus shipping which may be as much as $100 each time it is shipped to us, with the high cost of international shipping. We refused the $3.95 a month insurance for the device, at another $120 month. The reason this particular first month's rental was so high is due to the fact that we chose to try the device while cruising through the Panama Canal which including it being set to work not only in Panama but also Mexico, Columbia and the US while we're in ports of call. While at sea, it won't work being too far from a cell tower. During those periods of time, we'll use the ship's Internet access at $395 which provides us each with one hour online per day for each of the 15 days for this first cruise. This is expensive at $26.33 at roughly $13.17 apiece per day. MIFI from XCOM GLOBAL, although represented on their website as offering unlimited access, will not allow more than 750 megabytes in any three day period. If we do, they will turn off the system. This allows us each 100's of email messages per day, many more than either of us currently receive. We had decided that this would not be sufficient online usage for us. We have personal business to conduct, ongoing travel research and arrangements and of course, email messages from family and friends. Thus, when Internet access if of poor quality or unavailable, we will order the device to be sent to us. At this point we anticipate using the MIFI approximately six months of the year since many vacation home will have high speed Internet access. We are asking everyone to please continue to send us email with text only beginning January 1, 2013 while we're using the MIFI. Receiving text only email messages will mean "the world" to us being so far removed from everyone we know and love. Please keep the communication coming minus the videos and multiple photos. Posting those videos and photos on Facebook will enable us to see them when we aren't monitoring our usage. We love hearing from you. Today we're heading back to Scottsdale, after more sorrowful goodbyes, for our final four days before our trip to San Diego for two more days before boarding our cruise to the Panama Canal, taking us away at long last. Its hard to believe its finally only one week away. We have to repack all of our bags, clean our condo, finish our insurance planning, go to a birthday party and brace ourselves for what is yet to come. Merry Christmas to those who celebrate with warmest wishes to those who don't and to those who may celebrate another holiday this time of year. Comfortably ensconced in this Henderson, Nevada home from which we'll leave in 48 hours to head back to Scottsdale for our final four days of organizing and packing. The five hour drive awaits us as time to unwind after the busy but enjoyable eight days of precious time spent with family reminiscing about the past and dreaming about the future. Its all so clear to me now. More than ever. The preparations for Tom's birthday party on the 23rd, again last night, Christmas Eve and today, Christmas Day flowed with ease for me. I over-bought food, more than we could possibly need, throwing my cooperative house guests into an eating frenzy when they say so much less would have been fine. I agree. Never in my past have I ever over-bought food as I did this time. Perhaps knowing this was my last cooking "hurrah" for what may prove to be years to come, my association of "food is love" was definitely overdone. I couldn't get enough, the preparation or the love, the laughter, the memories, the photos or the stories, old and new, or the sound of Tom's laughter in the background. Saying goodbye. For us now, it was all about saying goodbye. A repeat of the sorrowful goodbyes in Minnesota. As I have written in the past, our choice to embark on an amazing journey doesn't make us exempt from feeling sad about leaving everyone behind. Its now becoming more real as we're only 9 day away from leaving the US. Today, Christmas Day is yet another family filled day, the third in a row with too much good food, an abundance of stories we've all heard before, laughter filling the air and love all around. Sound familiar? Ah, the human spirit gathers to celebrate this joyous time of the year. Merry Christmas to all of our readers, the people we know and the people we don't know and...to the people all over the world as I see in the stats, are somehow finding this blog reading it regularly. We'll see you soon. A hard working dedicated man, helper around the house, supporter of my every whim, compassionate to my every sorrow and infinitely able to make me laugh when I wanted to cry, my husband Tom has been a rock. Today, we celebrate his 60th birthday. The world didn't end of the 21st as he so fervently predicted, leaving us here today to celebrate his special day, the holiday season and our upcoming world travels beginning in a mere 11 days. Happy birthday, my love. I commend you for getting up from your former comfy chair, away from your Minnesota Vikings, out from behind your computer endlessly researching your ancestry and freeing yourself from the constant chatter of mindless drivel on TV in the background. I admire your courage to make this enormous change leaving everyone you know and love behind (except me) to venture out into an unknown world of uncertainty, risk and challenge. I admire you for leaving behind everything familiar in your world in which you found the cocoon that comforted you after long day's of work, the unbearable drive to and from, the smell of diesel fuel, and the wrenching exposure to chemicals around you each day. Reaching for a purpose beyond that which we currently know, you stretch yourself to the limits and I, a loyal follower travel with you. What lies ahead of us on the plains of Africa, the shores of southern France, the Mayan ruins, the Great Pyramids remains to be seen. Together, holding hands, we reach for the stars in the last decades of our lives, fearless, strong and in love. What more could I ask for? Nothing. Nothing more. So today for the first time on your birthday, I have no gift for you to unwrap. You have no room in your luggage for yet the tiniest of trinkets. I give you, Tom Lyman, husband, lover and best friend of mine, ongoing, ongrowing love and devotion combined with an unending curiosity to gain further knowledge of this side of you that I have yet to learn. This in itself, adds a element of adventure that I anxiously await. Happy birthday, Tom Lyman, for on this day your 60th birthday as we celebrate with family and friends, you embark on this new chapter in your life, with me, my love, simply writing the words along the way. 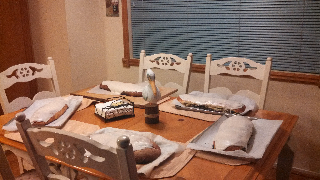 We made 5 giant Poppy Seed Strudels today, rolling the dough with a tall bottle of flavored water. ﻿﻿One of our favorites is an eastern European recipe for Poppy Seed Strudel, Tom's favorite, having missed it over the past year and a half on our restricted way of eating. I love this delectable pastry beyond words, a slice warmed in the microwave, covered with unsalted butter. Unfortunately, I consumed very little in the past knowing it could cause a spike in blood sugar. Now I will have none of it, not a taste. My health is more important, especially now that we are only 13 days away from leaving the US. So here is the recipe reminiscent of Tom's childhood, found online some years ago (no creation of mine, other than pulling it all together). It's really not hard to make. The prep time to make this entire recipe is less than two hours..
We have no rolling pin here. Stubborn, I won't buy one and will use a tall skinny bottle of chilled flavored water to roll the dough. It doesn't have to be rolled very thin so this will work. There was no small mixing bowl either here either so I used a soup bowl to mix the yeast and warmed milk. Oh well. (We also noted the lack of a potato peeler this morning. My sister Julie is bringing one from LA!). An Eastern European dessert table would invariably include something sweet made with poppy seeds, either ground or whole. This poppy seed strudel is made with a yeast dough and is known as makowiec (mah-KOH-vyets) in Polish. Canned poppy seed paste is available in the ethnic or baking aisle of most supermarkets. 1. In a small heatproof bowl, dissolve yeast in 1/2 cup of the warm milk. 2. In the bowl of a stand mixer or a large bowl, combine flour, sugar, salt and eggs. Add remaining 1 1/2 cups warm milk, butter and yeast mixture. With the paddle attachment, or by hand, beat until smooth. Dough will be sticky at this point. 3. Scrape dough into a clean, greased bowl. Sprinkle the top with a little flour and cover. Let stand in a warm place for 1 hour or until double in size. 4. Punch down dough and turn out onto a floured surface. Divide dough in half and shape each half into a rectangle. 5. Spread 1 can or half of the filling you made on each rectangle of dough and roll up like a jelly roll. Turn ends under so filling will not leak out. 6. Place on a parchment-lined or greased pan, cover and let rise again until double in size. 7. Heat oven to 350 degrees. Brush tops with additional melted butter. Bake 45 to 60 minutes or until strudels are golden brown. Don't let them get too brown. 8. Remove from oven and cool. When totally cooled, neatly frost with above frosting recipe or use canned white frosting if preferred. Over the years, Tom made dozens of bottles (over 150 wine sized bottles one year) of this fabulous holiday treat. We've given them as gifts to family, friends and co-workers nicely bottled, corked and imprinted with a custom made Christmas labels. Due to time constraints, we won't be making it this year and wanted to share the recipe with our readers, many of whom have enjoyed this in the past. Here you go! Enjoy! Blend all ingredients in blender for 2 minutes, then add 1 cup whiskey, measuring into the empty can of sweetened condensed milk in order to remove every last drop of the creamy sweetened condensed milk. Blend for another 30 seconds. Pour in a glass bottle with tight fitting cork. Keeps for 30 days in refrigerator. Should you decide to try either of these recipes or any other recipes we've posted, please don't hesitate to email me with questions. I check my inbox frequently and will get back to you quickly. Ah, the holidays. We love this time of year. So much gratitude. So much love. And of course, so much food! Yesterday afternoon we arrived in Henderson Nevada, a suburb of Las Vegas, to our vacation rental in Green Valley Ranch, a newer community with massive amounts of stores, restaurants, gated communities and a mere sprinkling of casinos. It doesn't feel like Las Vegas with its slot machines in every gas station or public building. Instead it feels welcoming, safe, and low on tourists. Entering the single family home for the eight days we reserved over Tom's birthday and Christmas, we knew immediately that we were "home." A fresh smell wafted through the air (love that word! ), welcoming us as we maneuvered through the door arms laden with "stuff." Unloading my arms onto the living room floor, I ran about from room to room squealing with delight. Each room had its own surprise to behold. From the stack of perfectly folded crisp white towels and washcloths in each of three bedrooms, two baths and an ample linen closet, to the full size bars of new soaps atop each stack, no stone was left unturned. The kitchen, fully stocked with every amenities, had a "working" ice machine, ground coffee, cream, some basic ingredients along with every small appliance we could possibly use. Three flat screen TVs, a pool table, stereo and old fashioned boxed games were available for our entertainment. The pool, although not heated and an extra $100 a day to heat (its too cold here now in the 30"s!) has a free-use hot tub (forgot my suit) in it well equipped yard with high top table, chairs, and a huge newer grill. Too bad its not 90 degrees! The rent for the eight days, although much more than we'll pay outside the US for most houses, was fair at $1500 which included a $250 cleaning deposit which we expect to get back. We did the math. Most likely we would have paid $165 a night for a hotel (including taxes) during the holidays, plus tips, valet parking, plus all meals in a restaurants and how much lost with easy access to gambling. Surely we would have spent at least $400 a day for a estimate of $3200. Staying in this lovely home, cooking for Tom's party, Christmas Eve and Christmas Day including our guests, our grocery and dining out budget is $1050, leaving us with a total of $2300 saving us $900 or more depending on how much we'd have lost gambling (we don't usually gamble but when its at hand, its hard to resist). This is the first Christmas in my adult life that I won't be shopping in a frenzy, wrapping gifts with elaborate hand made bows,, baking a wide array of delectable cookies and of course, decorating every corner of the house. In a odd way, it's liberating. We'll miss family back in Minnesota and we'll revel in family and friends here in Nevada. Life is filled with trade-offs. Soon, we'll head to our two dentist appointments for our final cleanings, then off to the travel clinic for Tom's final Twinrix vaccine. Then, to the grocery store for the ingredients for the lesser amount of baking I'll do this year. It won't be gluten free, low carb, sugar free, grain free, starch free. It will be delicious, fattening, gooey, filling up this lovely home with smells that remind us of "home." I won't take a taste. Tom will take off a few days for this special time, his 60th birthday and some of his favorite treats. Humm. There's no rolling pin. What shall I use in its place? P.S. After writing the above this morning then rushing out the door to the dentist's office, I had yet to post it. Upon returning a few minutes ago, it was imperative that I amend it. We just had the most amazing dental appointment in our lives, a referral from son Richard at Dr.Patrick Simone's office in Henderson, Nevada. Walking into his plush well appointed office put me, a dental phobic, instantly at ease. From the elegant upscale furnishings to the artwork to the well-equipped beverage bar and, the service, impeccable! Even the restroom was a sight to behold with every imaginable accoutrement. It almost felt as if we should tip not only the receptionist but also Terry, the knowledgeable, personable and thoughtful hygienist. Instead of the usual hand performed cleaning, scraping away at our gums and teeth, Terry used a laser implement as an adjunct to the traditional cleaning. She used before and after photos that were shocking. After the cleaning she performed what she referred to as "sand blasting" the surface of our teeth with a high powered baking soda spray. The taste was awful. The result, mind blowing. My teeth haven't been this white since I was a toddler. We couldn't be happier. As we paid our reasonable bill of $226 (for both of us), they thanked us profusely handing us a giant apple pie! Who gets an apple pie from the dentist? I was thrilled with the bag of dental supplies Terry loaded up for our travel. And then, this giant pie. Wow! Need I say that we were impressed? If you live near or around Henderson, or are visiting Las Vegas and a dental situation arises, Dr. Simone's office is the place to call. Gee....for the eight days we're are here in Henderson over the holidays, this does feel like home...minus the grandkids, the grown kids, the friends, the beautifully decorated tree, the elegantly wrapped gifts, the over sized glass jars filled with home baked cookies, the Santa Bears adorning every corner and on and on. Life will be different going forward. Good but, different. Tom is the youngest of a family of eleven with eight surviving. The eldest, Jerry is a sharp 84, funny, loving, savvy in today's world and totally blind. Tom will be 60 five days from today, December 23rd. They share a 24 year difference in age. While in Henderson Nevada on December 23rd (we're leaving tomorrow), we'll celebrate Tom's milestone birthday with a gathering of family including three of Tom's sisters, two brothers-in-law, several of my family members and local Henderson friends with a wide array of homemade foods, special drinks and as we pleaded, no gifts! (There's no room in our luggage). Originally, the intent in writing this blog was to stay in touch with family and friends as we travel the world over the next 5-10 years. Initially, the plan was to post once a week with photos and updates. As the preparations began, we realized that this information, so diligently researched, may be of benefit to other travelers both young and senior. Much to our surprise, we've attracted readers from all over the world. It wasn't long before Jerry and his lovely wife Lee, heard about our blog as did many other family members. Jerry began "reading it" on his computer utilizing a software program, Jaws, instituted for the blind many years ago. A few months ago, upon updated the look of our blog, Jerry was no longer able to "read" the text due to formatting changes. His frustration was evident when he asked if there was a way we could get it to him. His problem was a dial-up connection in his home, not friendly to intense graphics. Tom and I discussed the options and Tom suggested that he copy and paste each new post he receives in his email (he signed up to receive email notifications of each new post), text only, and email it to Jerry. This proved to be a perfect solution and Jerry has happily followed along with our updates. In addition, when Jerry receives each post, he prints a copy to share with Lee, and he and Tom's sister Patty, who doesn't have access to a computer. I SURE DID TRY TO FIGURE HOW I COULD JOIN YOU GUYS FOR TOMS PARTY. FIGURED IF I MADE ALL THE PLANS ABOUT THEN MY OLD BODY WOULD GIVE OUT ON ME. SO DECIDED TO STAY HERE WITH MY FAVORITE NORWEIGEN. SO AS YOU TRAVEL YOU TWO WILL BE MY EYES. Its evident from this sweet message what a terrific guy Jerry is, as a brother, husband and friend. It brings us great comfort to know he and Lee are "following along" with us in our travels. So, as we travel documenting our experiences along the way, we will always keep Jerry in mind, know that he is hearing our adventures, hearing our dilemmas, hearing our joys and hearing our photos which we'll describe in a way enabling him to "see" what we are seeing, feel what we are feeling and share in the many treasures our world has to offer. Thank you Jerry. The gift you give us, is your interest, your enthusiasm and your love which we will carry with us, wherever we may be. Yes, Jerry, we'll be your eyes. Photos of upcoming vacation home in Nevada! Pool and hot tub in Nevada house. Below are the photos of the Henderson, Nevada vacation rental we'll be moving into this upcoming Wednesday after a five hour drive across the desert. We posted these photos many months ago, doing so again today for our newer readers. A charming house with great reviews in VRBO.com located in the fabulous Green Valley Ranch area in Henderson, a suburb of Las Vegas, will definitely serve our needs for eight days over the holidays with family and friends coming to visit for the three days between Tom's 60th birthday on the 23rd and Christmas. We couldn't be more thrilled. Over the next two days we'll busily pack for the eight days in Nevada, finish the balance of our paperwork, pack the food and cooking supplies we've accumulated while in Scottsdale and the hardest part of all...decide what we're leaving behind in one final bin we'll leave at son Richard's house. This is the hardest part. Once we leave the vacation house in Henderson on the 27th, we return to the vacation house in Scottsdale for our final packing before leaving on January 1st for San Diego to ultimately sail away on January 3rd. Any items we don't bring to Henderson now become a part of our luggage, an impossible scenario. Casual dining and lounge area off of the kitchen. We have warm clothes that we aren't bringing (Good thing we brought them along for the cold weather we've experienced lately), piles of papers to pass off to my sister Julie who'll spend Tom's birthday and Christmas with us as well. Pool table in living area. Julie will keep our medical files with test results, our health care directives and stacks of legal documents that we completed on Friday. We'll leave our tax prep receipts in a banker's box with Richard. Kitchen is dated but serves our needs. Oh, it goes on and on. There's so much to remember much of which I listed on a Nevada "to do" and others that require me walking around and "looking" at everything to further remind me. Thanks goodness my memory is serving me well. Not only will we move into the house below but we'll get ready for Christmas, baking (for guests), decorating (just a little) and go to our dentist appointments for final cleanings. After the dentist, Tom has an appointment at a local travel clinic for his last TwinRix vaccine. The house from the street side. Plus, we'll complete the arrangements for the sale of Tom's car (prospective buyer in the works), hopefully to transpire while we're in San Diego over the last two days. If, that doesn't work out for any reason, of course, we have Plan B. Hot tub as part of the pool. On January 2, we'll take the SUV to a local dealer and sell it for whatever they'll give us. Apparently, there's a shortage of clean used vehicles. After pricing it at Edmunds, we feel confident that we will sell it for close to the dealer's wholesale price. It's a 2010 model and in perfect condition. We're already prepared for a low offer accepting this reality as part of the process, especially after doing so poorly at our estate sale. Ouch! Nobody cares to pay what we feel "our stuff" is worth. Here's the link to the details and photos about the Henderson home. (Please excuse the formatting issues. Its rather tricky copying and pasting photos from other web sites. As I've mentioned in the past, web design is not my forte). Our lives seem so small today, our plans so meaningless, as we try to grasp the pain and sorrow of so many families as the result of yesterday's horrific shootings in Newtown, Connecticut. As hard as we may try to imagine their loss, their grief, we are left motionless, unable to step into their shoes for a moment to feel the helplessness, the hopelessness surrounding their lives. We've all lost someone we have loved, many suddenly, many without but a logical sense of "why." I often cringe when I hear the well intended speak trying to justify why it was acceptable that a life, young or old was stolen from a loved one. No words can justify the loss of a life, let alone the loss in ours. We all grieve. And yesterday, and today, and many more days to come, we will wonder how this could happen in a quiet little town, seemingly exempt from such nightmares. No one is safe. We live in frightening times. Then again, many times were frightening; wars, natural disasters, a wagon train traveling across the country in search of a better life surrounded by danger when a broken wheel could mean certain death for an entire family. All times have been hard. No one, no time is exempt. Yet, we can't live our lives in fear. The danger is beside us every moment, an illness, a fall off of a ladder, a car crash or a violent crime. There is danger everywhere. We watch the news, relentless in its pursuit to devastate us with one heart wrenching story after another, glued to the TV, unable to look away fearful we'll lose our connection with the tragedy. We must stay attached to express our sympathy and to offer our prayers. Our natural human curiosity is an adjunct to our empathy and to our sadness for the victims and their families. We watch. We listen. We imagine if it was us. We are grateful it wasn't us. But we genuinely care. There was no reason for this. There is no lesson that we'll learn. Will we suspiciously monitor every quirky kid among us? Judge every parent who may be doing their best? Change laws that the demon will work around? We live in dangerous times. Its too big to change. We're all so sorry. Its been nagging at me. I think about it every day with a sense of dread. On the massive Excel spreadsheet I created for our 5 to 10 year worldwide journey, there is a worksheet page entitled "To Do in Scottsdale." It contains all the paperwork tasks we've had to complete before leaving the country on January 3, 2013. "To Do" lists never intimidated me, no matter how lengthy. I've always taken great comfort it chipping away at task after task ensuring each one completed in its entirety before going on to the next. Yes, I know. I'm rather obsessive. We live with that. It doesn't intrude in the enjoyment of our lives, we don't fight about it and it doesn't prevent us from a rich and full life. Perhaps, in a certain way, it adds to our lives by eliminating thoughts of all the "things" we have to do. One by one, I chip away at them, freeing our thoughts to more fulfilling moments. No one ever heard me say, "Oh, I can't come to the party 'cause I have to fill out forms." Never. 2. Prepare and get new Living Wills and health care directives notarized. 3. Prepare our taxes up to date, amending the last two weeks of this month at the end of the month forwarding everything to our accountant by snail mail. Oh, tax prep, I despise this task! Always have, always will. Yesterday, I began the process and today, it will be completed except for additions as mentioned above. We couldn't imagine living in Belize, steps from the ocean and ever feeling like going through that bag of receipts, let alone hauling them along with us. In future years, we'll have used our handy Doxie portable scanner saving all tax related items. Much easier to do as we go then dread it all along. A few people have asked, "Will you still file tax returns and pay taxes in the US?" The answer is "yes," always. We will always remain US citizens, as do many expats living outside the US. Having saved every receipt for absolutely every dime we have spent since leaving Minnesota on October 31, 2012, it was also time to enter our "actual" costs into that budgeting expense records. Upon completing the tax portion which I will finalize today, I started totaling the other expenses, such as food and entertainment. Our total cost for the three day drive to Scottsdale $780. We had budgeted $1065 but arrived one day early. Fortunately, the property manager didn't charge us for arriving a day early but had he, we still would have been within the budget. Preparing the taxes and totaling the receipts (all of which we've saved) finally enable us to see how we're doing on our budget. As I mentioned, going forward, we'll log (scan) and toss each receipt as the expense occurs to avoid hauling around a growing bag of receipts. Here's where we are so far for the variable expenses for food and entertainment with only 18 days left in 2012. We've been in Scottsdale 40 days as of today, arriving on November 3rd for an average cost of $30 per day. With 6 more days until we leave for Henderson, we'll plan to spend another $180 for a total of $1377, leaving us an overage of $623.00. Thus, our total available for Henderson is $1673. Preferably, it won't be necessary to use this overage, putting us ahead of our budget right out of the chute. We'll see how it goes, posting our "actual" costs later. Of course, there are other costs we are reviewing and will be posting as we go along. Today, I will finish the tax prep after my trip to the health club, leaving the file ready to receive the remainder of this month. Tomorrow, we will re-do our wills bringing them up-to-date and re-do our living wills, getting them notarized at the end of the day. Also, VisaHQ, our visa and passport processing company, sent us an email that our second passports will be in our mail within one week. Yeah! We did all the paperwork correctly! By this weekend, we can relax knowing that the worst of our paperwork is done, a huge relief. The risk was real. Tom was losing weight while I packed for our 5-10 years on the road, traveling the world. Some suggested we bring one duffel bags each. If we were going for a weekend, that would have made sense. We have no home to go back to and repack. We have no place to go and do laundry and get ready for another round. Dirty clothes travel with us. So, we packed big. When we arrive at our various vacation homes, we'll wash clothes. On ships, we'll place them in a cloth laundry bag to haul to our next location. We are OK with this. Its been discussed at length. So we each have three bags, a carry on, a computer bag, purse and...two 250 pound capacity wheeling carts that holds it all. Once we go to Africa and return to Europe, we'll mail our big boots and Africa clothes back to Nevada in order to lighten the load (thanks again, son Richard). We had decided that toward the end of our time in Scottsdale that we would repack, suctioning the air out of our Space Bags, sorting cruise suitcases from the others. This way we'd only have to open one or two bags each on the cruise. This idea came to us only after the bags were already packed months ago. When I shopped for Tom last summer, he was down about 30 pounds. The weight loss had slowed to a snail's pace and honesty, I didn't think for a moment that he'd lose another 20 pounds. We were enjoying our way of eating (low carb, grain free, sugar free, starch free) and he was losing about one pound a month at that point. Who knew? When he started eating this way 16 months ago, he wore size 44 pants, mainly due to his belly, certainly not the rest. When I purchased his new clothes, I purchased size 38 pants and XL shirts figuring at the very most he'd lose another three or four pounds until we left the US, thus not affecting the fit. Since shortly before we left Minnesota, he's since lost another 20 pounds now down a total of almost 50. Wow! Who cares about clothes? My man is healthy and slim! His health has had a complete turnaround. He's now a size 34. Yesterday, we unpacked all of his clothes. There are 18 (yes, 18) pairs of a combination or shorts, casual khaki pants, dress khaki pants, jeans and dress/suit pants (for formal nights on cruises) that would fall off him if he wore them. And I mean fall off! They look ridiculous! We can salvage the swimsuits. They have the string ties in the waistbands. OK. Guys wear baggy swimwear, don't they? But the pants have to go! Today we are taking everything to an alterations shop in Old Town with the thought that we'll only have the dress pants altered. We're bringing along the other 15 items. Maybe, just maybe, the tailor will be willing to give us a deal on the lot of them, getting them done in less than three weeks Unlikely. It will probably cost less to start over. If the tailor is not cooperative we'll go shopping this week in Scottsdale to replace everything. There's no time to shop online with only a week until we leave for Henderson, Nevada for eight days for Christmas with family. We'll have not time while we're there. Plus sales tax is higher in NV as opposed to AZ. Tom despises shopping but I'm fast. He can wait in a try-on room while I'll throw pants at him. He can bring his phone and play Angry Birds while he's waiting. It will be OK.
Hummm...10 inches lost in the waist. Remarkable! Better health. Amazing! Perfect colonoscopy and endoscopy results. Astounding! No more IBS. Impressive! Able to carry bags without puffing and panting. Yeah! Who cares about buying new pants? No one. Living in Scottsdale, budgeting for this life..